Fronius is introducing its Ohmpilot solution to the Australian market. The Ohmpilot is a consumption regulator that can utilize solar electricity not used in the home to heat water in boilers or buffer storage tanks. The Fronius Ohmpilot can direct excess solar PV generation towards electric water heaters. Austrian inverter supplier Fronius is introducing its Ohmpilot consumption regulator, which it says can allow an average four-person household to meet 50% of its hot water demands with excess PV electricity. The system couples to a Fronius inverter or energy management system, turning hot water systems on when there is a surplus of solar energy that would otherwise be sent to the grid. Fronius points to the development as a sign that sector integration is becoming increasingly important in the generation and use of renewable energy. With the device, households that have solar installed will be able to increase their rate of self-consumption, particularly when residents are away from the home during the day. Heating water can be a more effective way of utilizing solar output during the day than storage in batteries – which still remain expensive and may not be cost effective for many households. The Ohmpilot device has a continuously adjustable output range of almost 0 – 9 kW. The power can be fed to heating elements in boilers and buffer tanks, although it can also be utilized by infra-red heaters and heated towel rails. 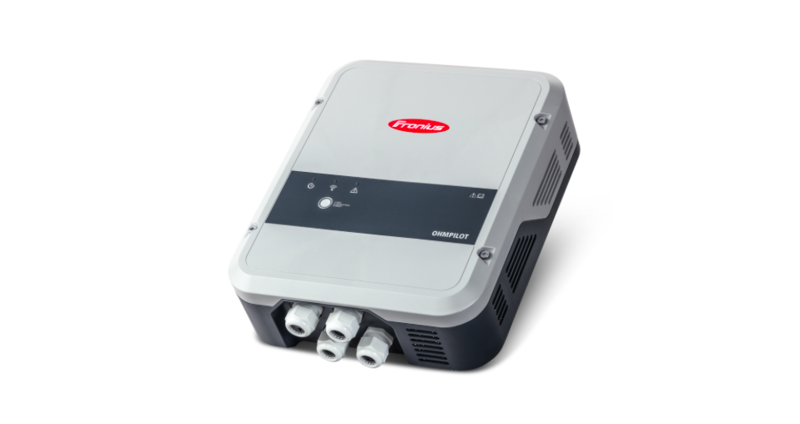 In Europe Fronius prices an installed Ohmpilot unit between €1,100 – €1,300, including the cost of retrofit.